He has performed in concert with Grammy-winning artists Michael Brecker, Bob Mintzer, Bobby Shew and Pete Christlieb. His compositions have been recorded by jazz greats Chick Corea, Larry Coryell, Eddie Gomez, Dannie Richmond, and Bennie Wallace. 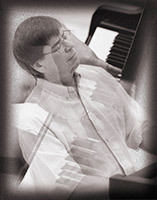 He has over 100 jazz compositions and 70 compositions for symphony orchestra, band, chorus, solo piano, chamber ensembles, song cycles, and electronic music. For 26 years, Dr. Doug Davis has been sharing his musical talents with the California State University community and beyond as a professor of composition and director of the jazz ensemble. CSU Bakersfield jazz groups are consistently among the best at the largest competitive collegiate jazz festival in the western United States, having won in the small group category seven times. In addition, they have twice been awarded the top Community Big Band award and won the top honor as Four-year Collegiate Big Band. "Of all the bands I've heard from just about everywhere, by far the best two jazz groups at this festival come from Cal State Bakersfield. What a pleasure to listen to this caliber of musician!" said Neal Finn, former director of jazz bands at California State University, Long Beach and Berkeley festival judge. Thanks to Davis' leadership, the CSUB jazz program was one of just 12 schools nationally to receive a featured review by Jazziz magazine in their annual focus on jazz education. Two former students have received the prestigious Kennedy Center Betty Carter Awards and presently a Downbeat Magazine student award winner is performing in the jazz ensemble. "I was very much impressed by his originality, daring, and imagination in both composition and performance," wrote David Baker, former president of the International Association of Jazz Educators in a review of the program. "I was also impressed with his ability as a teacher to train and inspire a student group to perform with such skill and understanding." In the greater CSUB community, Davis is probably best known for leading the Bakersfield Jazz Festival. For 21 years this two-day event has regularly featured Grammy-winning and poll-winning artists along with student and local groups. Dubbed "Bakersfield's Rite of Spring," the festival has become one of the community's largest events with 5,000–8,000 in attendance annually. Monies raised by the festival are used for scholarships to CSUB students majoring in many academic disciplines. Each of the last five Bakersfield Jazz Festivals has given more than $20,000 in student scholarships utilizing the President's matching scholarship grants. To date eight scholarships with more than $80,000 in scholarship funds have been established and fully endowed by the festival. "Dr. Davis has probably done more to put CSUB on the international map than any other person or group of people in our institution," said Manuel Esteban, president of CSU, Monterey Bay. "And what is most appealing about his personality is his incredible modesty. Regardless of the importance of the musical event he brings about, he invariably remains behind the scenes, supporting others and highlighting their efforts." In 2003, Dr. Davis established the Legends of Jazz Concert Series that has brought such artists as Ahmad Jamal, Kenny Garrett, and Sammy Nestico. 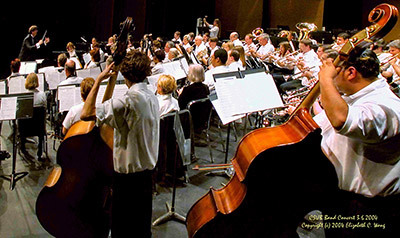 Also in 2003, Davis established the Guest Composer Series that brings six composers annually to the campus for concerts by the CSUB Concert Band, Jazz Ensemble, and chamber groups. Recent international performances include "Psalm of an Orange Angel" by the Hungarian Symphony and "Token" for voice and orchestra featured at the Ukrainian "Contrasts" festival, both recorded on CRS. In 2005, the International Society of Composers selected "Family Portraits" for their recording of contemporary song cycles and is released on Capstone Records. Davis' list of honors includes a Woodrow Wilson Fellowship, Harvard's Paine Traveling Fellowship, a National Endowment of the Humanities Fellowship, a David Van Vactor Composition Award, and two Contemporary Recording Society Awards. He has been selected both CSUB's Outstanding Professor and Alumni Professor of the Year, and has been honored by the community with two Beautiful Bakersfield and five California Arts Council awards. According to Davis, his greatest accomplishments are with students. "To nurture the development of students is the most rewarding challenge of my life," he said. "Helping students gain insight from their perceptions and confidence in their abilities, imagination, and creativity is the great pleasure of being a teacher." Monies he received from winning the prestigious Wang Award in the Visual and Performing Arts now endow a scholarship dedicated to the creation and performance of new music. Written by Kathy Miller, Cal State University, Bakersfield.